Craftsman 100pc. Drill Bit Accessory Kit Just $14.99! Was $29.99! You are here: Home / Great Deals / Craftsman 100pc. Drill Bit Accessory Kit Just $14.99! Was $29.99! 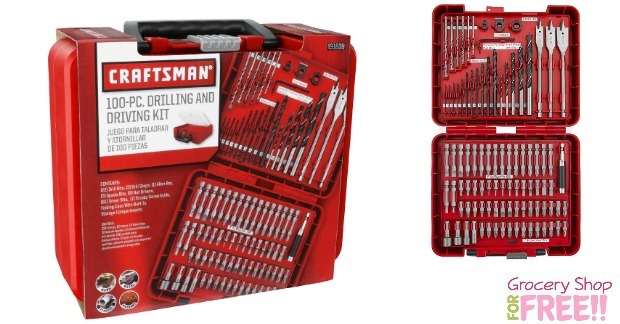 Right now you can get this Craftsman 100 pc. Drill Bit Accessory Kit for just $14.99down from $29.99! This would make a great gift! Make sure to have it sent to your local store for pickup, making the shipping FREE! The Holy Grail among handy guys and gals, this Craftsman 100-PC Accessory Kit has everything you need to get the job done. Rather than build your tool set bit by bit, save time and money with this versatile all-in-one kit. Equipped with all the standard bits utilized in hundreds of household and general purpose projects, this Craftsman kit includes Phillips and flat driving bits; drilling bits for powering through plastic, wood, metal and masonry; plus power bits and insert bits to help fill all your driving needs. Everything is made from hardened alloy steel, so you can expect this accessory kit to remain your right-hand man for years to come. This ultra-versatile 100-PC Accessory Kit also comes with a durable, compact carrying case, a must for keeping all those dozens of bits from going rogue and disappearing into some unseen corner of your garage.